Green’s Green is engineered to promote growth, health and color. Green’s Green delivers highly available N-P-K, in addition to a micronutrient package, and is chelated with amino, humic and fulvic acids. Other beneficial constituents include vitamins, enzymes and fermentation extracts. Our proprietary bio-surfactant technology is incorporated to reduce surface tension and enhance foliar absorption. Green’s Green is ideal for promoting healthy growth and color in cool season grasses, as well as, dormancy break and transition in warm season grasses. Excellent tool for maintaining optimum clipping yield and turf quality throughout the growing season. 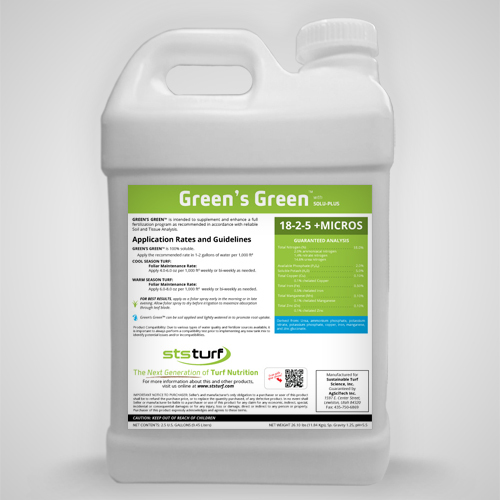 Solu-Plus, the STS Nutrient Mining Technology™ and nutrient extender is included in this product to assist your turf in utilizing the many beneficial nutrients and compounds without becoming restricted.